Tomorrow is one of my favorite days of the year. The UCLA vs. USC game. Well, it's my favorite day of the year when we win! Last year we went to the game and it was pretty much the best day of my life. I cried as the clock counted down the final seconds and we ended our losing streak. I rejoyced with the other Bruin fans when we won. I laughed as the USC fans walked out of the Rose Bowl with their heads held low. It was the best day of my life. We're watching the game at home tomorrow with friends. I refuse to go to the Colosseum since we got stuck there at the game in 2001, which happend to fall on my 21st birthday. Our car got stuck in a homeless man's lot. He promised he wouldn't double park, but he did and we were stuck there for what seemed like hours waiting on the guy who's car was blocking everyone elses car on my birthday. I just hope UCLA can pull it off. How awesome would it be if we went to the Rose Bowl??? But besides that, I really want UCLA to win so Coach Karl can keep his job. He's too hot to get fired! Hauggy can hardly contain his excitement. 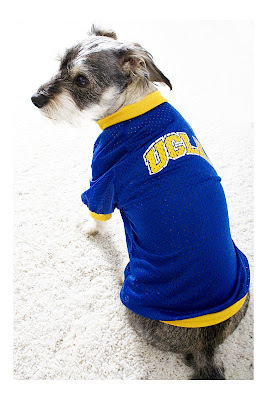 He's been wearing his UCLA jersey all day. Doesn't he look enthusiastic? Go Bruins! I can't even fathom the idea of USC tainting our home field. Yuck! I LOVE the UCLA jersey. Where on earth did you get it? Muttropolis at Fashion Island. Isn't it awesome? !